A special thank you to our partners at Nine Network for creating a video of the 2012 St. Louis Arts Awards. Presented since 1992, the St. Louis Arts Awards is the preeminent award ceremony honoring individuals who achieve a legacy of artistic excellence, and organizations and businesses that enrich St. Louis’ arts and cultural community. 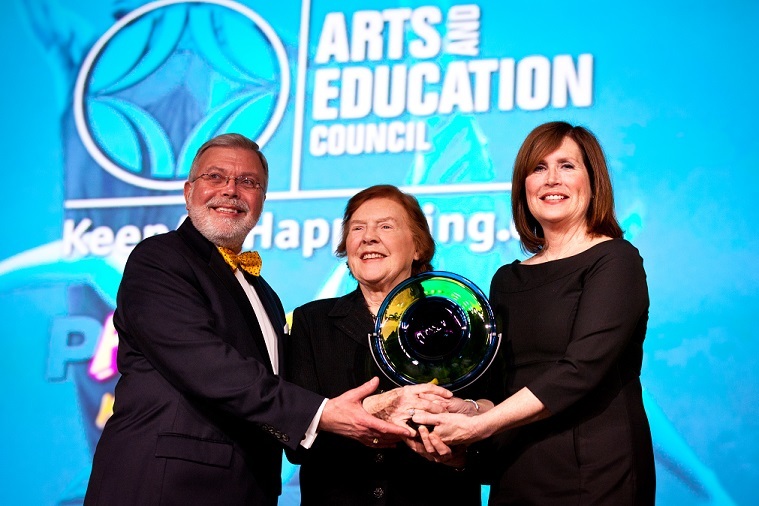 The 21st annual St. Louis Arts Awards, chaired by Tom Voss, president and CEO of Ameren, and his wife, Carol, was held on January 23, 2012 at the Chase Park Plaza. Follow #STLArtsAwards on Twitter for announcements for the 2013 Arts Awards. Those honored in 2012 are: Novus International, Inc., Corporate Support of the Arts; Mabel Dorn Reeder Foundation, Excellence in Philanthropy; Contemporary Art Museum St. Louis, Excellence in the Arts; Peter Martin (jazz pianist), Excellence in the Arts; Joan Lipkin (That Uppity Theatre Company), Arts Innovator; Linda Kennedy (The Black Rep), Lifetime Achievement in the Arts; and Jason Brown (Riverview Gardens School District), Art Educator of the Year. Novus International, Inc. has committed its time, resources and people to the artistic well-being of St. Louis. The company empowers its employees to become active in the arts community through philanthropy, education, and basic awareness and appreciation of all of its mediums. Novus is an active supporter of the Contemporary Art Museum St. Louis, Dance St. Louis, St. Louis Ballet, Shakespeare Festival St. Louis, and the Arts and Education Council. The Novus Arts Program also empowers its employees to select art from around the world for display at their headquarters thereby giving them the opportunity to learn about the cultural influence and artistic traditions of the countries where Novus operates. The Mabel Dorn Reeder Foundation has contributed greatly to the building of the St. Louis Symphony’s endowment and generously supported its annual campaign. Through its co-trustee, Dr. Mabel Purkerson of St. Louis, the Foundation has also encouraged new, increased and additional gifts to the Symphony through multiple challenge grants. In December 2010, the St. Louis Symphony was the first recipient of the Mabel Dorn Reeder Honorary Chair, a $2 million gift to endow the position of associate concertmaster, from the Mabel Dorn Reeder Foundation. The generosity of the Foundation also includes a recent $2 million contribution to Opera Theatre of Saint Louis – the largest-ever single contribution Opera Theatre has received in its 35-year history – to help endow its acclaimed professional development programs. The Contemporary Art Museum St. Louis (CAM) is dedicated to exhibiting the visual arts and artists of our time and to producing nationally recognized education programs. As a non-collecting institution, CAM focuses its efforts on featuring local, national and international, well-known and newly established artists from diverse backgrounds, working in all types of media. As a resident in Grand Center, CAM has served as a significant partner with other cultural organizations to revitalize and develop the area, and provides numerous programs for the general public, families, teens and local artists. Peter Martin received the Presidential Scholar in the Arts award from President Reagan soon after graduating from high school in St. Louis. He then attended The Juilliard School in New York on scholarship, studying with Martin Canin, until moving to New Orleans in 1990. While in New Orleans Martin worked with key musicians and embarked on an active solo career while touring and recording with artists such as Betty Carter, Wynton Marsalis, Dianne Reeves, Chris Botti, the Jazz at Lincoln Center Orchestra, Roy Hargrove, and Joshua Redman. Martin performed on and arranged Dianne Reeves’ Grammy®-winning release A Little Moonlight and appeared in George Clooney’s 2005 film Good Night, and Good Luck as well as being featured on the Grammy®-winning soundtrack. Martin is also an accomplished arranger and composer who has performed on five continents. His works have been performed by numerous orchestras worldwide including the Los Angeles Philharmonic, the Berlin Philharmonic, New York Philharmonic, St. Louis Symphony, San Francisco Symphony, and Sydney Symphony. Joan Lipkin is the producing artistic director of That Uppity Theatre Company which she founded in 1989 to put the principles of cultural diversity into innovative theatrical practice and to promote arts-based civic dialogue and related activities. Lipkin specializes in creating original work with underrepresented populations including people with disabilities, women with cancer, LGBT youth and adults and their families, adolescent girls, youth at risk, Alzheimer’s patients, and college students. Her company also addresses topical issues including racism, xenophobia, heterosexism and ableism and carries those messages to educational and cultural institutions, corporations and social service agencies. Lipkin also founded the nationally acclaimed Alternate Currents/Direct Currents Series, the Louies and Apple Pie and co-founded The DisAbility Project with occupational therapist Fran Cohen. Linda Kennedy is a veteran actress who has performed with The Black Rep for nearly 30 years. She recently appeared in The Black Rep’s world premiere of The Montford Point Marine and Avalon Theatre’s Agnes of God. Kennedy has also directed numerous works with various theater groups throughout St. Louis. As the artistic associate and education and community programs director at The Black Rep, she performed in Remembrance of and Voices from Harlem, one of The Black Rep’s touring productions. Kennedy has also conducted workshops for children for Stages Arts Academy, Portfolio Gallery, and St. Louis Connect Care’s Abstinence through the Arts program and has performed with Upstream Theatre Company, Juneteenth Legacy Playwriting Festival, Young Audiences of St. Louis, and many others. In his role as director of fine arts at the Riverview Gardens School District, Brown has opened the world of art to many students. The high school choir has had the opportunity to perform in many community venues including Powell Symphony Hall. Additionally, he has demonstrated his commitment to excellence by securing grants for students to attend local performances, participate in cultural art activities throughout St. Louis, and purchase new instruments for middle school students. Brown also organized and hosted Riverview Gardens’ first “Fine Arts Showcase” which featured many performances and visual works of art by the district’s students. The community-wide event was well-attended and provided a positive spotlight on the district’s arts program.